Many of you out there probably find the field of economics extremely boring and/or difficult to understand. My real first exposure to the study of economics was my freshman year of college when I took Econ 110. I loved it, though my grades probably did not reflect that, because it explained, well, everything. Interest rates, wages, trade balances, and Gross Domestic Product, of course, but it also explained about life in general, how people operate and how they respond to a variety of social, political and economical incentives. 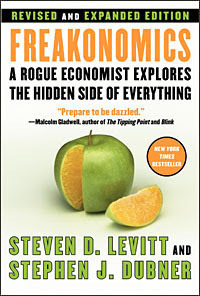 I preface my blog today with this statement because I consider Freakonomics one of the best books I have read in a while, though I realize you non-economists out there may consider me a freak for thinking so. What do US schoolteachers and Japanese Sumo wrestlers have in common? Answer: Both are thought of as very honest and honorable. But both have incentives to cheat, and do. Can selling bagels by the honor system (leaving them at an office with a collection box) work in Washington D.C.? Answer: Yes. About 90% of the bagels are generally paid for. Bonus question: Who is more likely to take a bagel without paying? A high level executive, or his lower level sales and administrative employees? Where did all the criminals go? In the late 80s, crime was on the rise and all the “experts” predicted that trend to continue. But in the 90s, crime rates across America dropped dramatically. Answer: Newspapers and politicians would tell you that it was the innovative policing strategies, the aging of the population, tougher gun control laws, a strong economy, or the reinstatement of the death penalty. They would all be wrong, though. The data reveals that longer jail terms accounted for 33% of the drop in crime in the 90s, hiring additional police officers–10%, and the crashing of the crack/cocaine market–15%. What about the other 42%…Steven Levitt attributes it to the legalization of abortion due to the Roe v. Wade Supreme Court decision. Young, low-income mothers’ babies are more likely to grow up to be criminals, and young, low-income mothers have been most likely to take advantage of legalized abortions. Future criminals are being killed before they are even born, causing a major decline in crime rates. Levitt takes on these and other controversial topics, like racial inequities in America and the Black/White gap. But he addresses these issues from a unique, data-driven perspective and he reports his results with refreshing candor. I could easily continue to cite the amazing jewels hidden within this book, like that the per-hour death rate of driving and flying are about equal, but I’ll let you read it and discover them for yourself. Well, I probably won’t read it, but these bits you shared seem quite insightful.